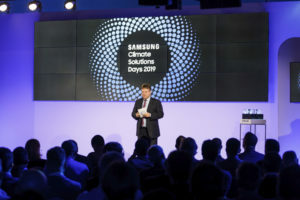 Samsung Electronics Air Conditioner Europe hosted the Climate Solutions Days in Monaco, the pan-European annual event dedicated to the air conditioning. With the presentation of the new trends in the air conditioning and heating sector, the awarding of the most cutting-edge installation projects and in-depth technical sessions on the latest innovations from Samsung, the event saw the participation of 180 Samsung customers and market leaders from nearly 30 countries. Wim Vangeenberghe, President of SEACE who recently took on the role of Vice President of Samsung Electronics’ Global HVAC Solution Business Division, analyzed the key aspects of the air conditioning solutions, including: refrigerants, intelligent controls and IoT, heat pumps. During the Climate Solutions Days, Samsung’s main innovations were presented: among these, Water Solution (technology that makes possible the lowering of the GWP index of the whole climate system thanks to a project based on the heat recovery able to optimize the energy consumption), the expansion of the range of products with R32 refrigerant gas for residential and commercial applications, Samsung b.IoT (Building Management System that improves the energy performance and the comfort of the buildings based on intelligent algorithms) and One Samsung (solution that includes the entire line of Samsung Electronics Home, Retail and Office products). Besides, during the event the first edition of the Samsung Climate Solutions Awards was inaugurated to reward the best installations realized during the previous year. Finally, the meeting was an opportunity to focus on the important results recorded in 2018 by Samsung AirConditioning Italy, the Italian branch of SEACE. The positive conclusion of 2018 saw the growth of the Systems categories, in particular VRF with a +20% and the heat pumps with +24% compared to 2017. Within this scenario, the DVM and EHS systems recorded an increase in turnover of +31% and +82% respectively. The solutions with WindFree technology belonging to the premium residential segment, which recorded a 40% growth compared to 2017, and the extension of the WindFree family in the Systems and Light Commercial segments were the driving elements of the performance that Samsung AirConditioning Italy recorded in the course of 2018.